In some parts of Australia, farmers are known as cockies — a shortened term for cockatoo, the large, crested, squawking parrot that also inhabits the farming areas. 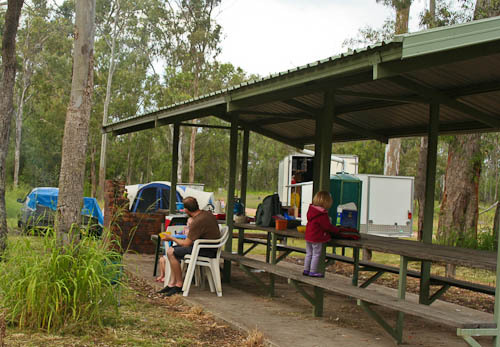 Our stay on the banks of the Condamine River coincided with encounters with the two types of cockies. 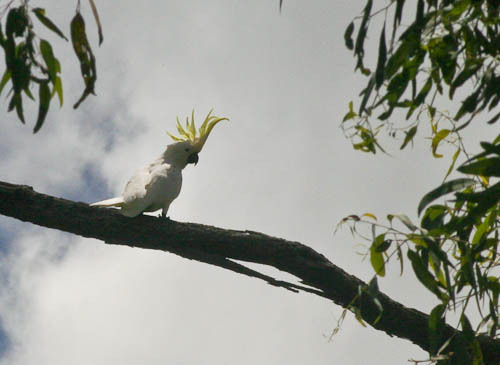 Sulfur-crested cockatoos flocked in the tall branches of the gum trees in the Condamine river forest, and we met a couple of friendly farmers who lent us a hand when we needed it most. 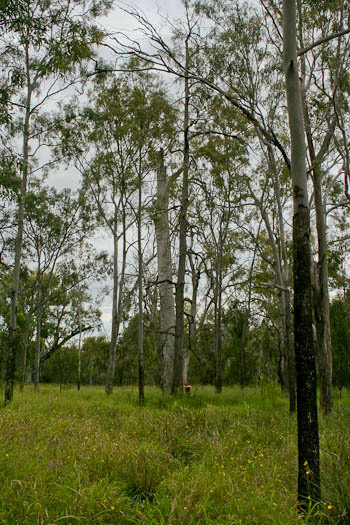 Our trip west continued through Toowoomba and out on the Warrego Highway to Chinchilla. 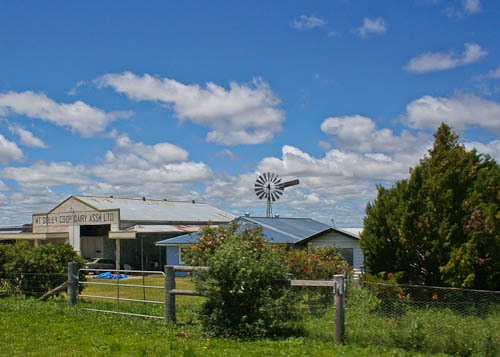 The countryside around Toowoomba was dotted with older, charming farm buildings. 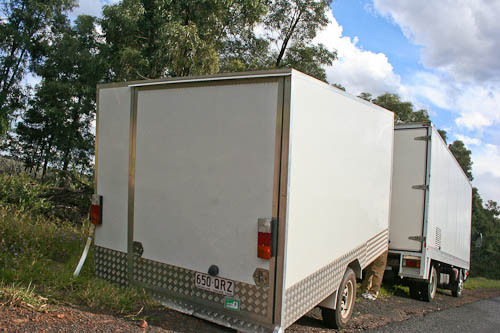 When the trailer broke, we were only a couple kilometres short of our campsite on the banks of the Condamine River outside Chinchilla. I was driving when the three steel supports that formed the trailer’s draw-bar snapped. A horrible grating noise alerted us to the problem. I pulled the truck to the side of the quiet country lane, and David and I both hopped out of the cab and ran to the back. 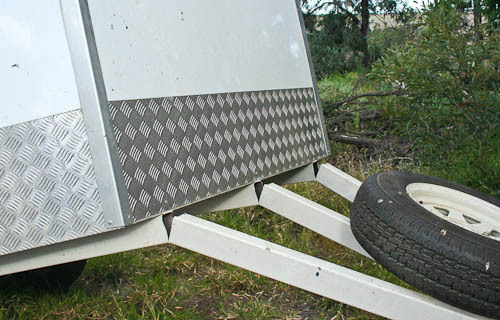 When the draw-bar snapped, the back of the trailer dragged along the road. The trailer was still attached to the tow-bar, but sitting at an angle, with its backside dragging on the ground. The decorative checkerplate steel around its base was chewed up by the bitumen. We looked at the steel that that snapped and could see how the original construction of the trailer used too light a grade of steel on the draw-bar. 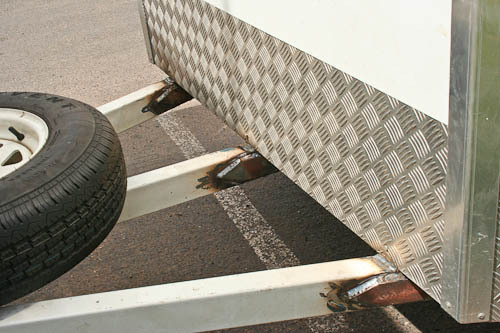 Light-grade steel is light-weight, but it wasn't sufficient for this trailer! Richard and Sharla were driving behind us, and after they pulled up, Richard got out and came to inspect the damage. After a bit of discussion, David and Richard wrapped up makeshift supports on the draw-bar by using two heavy axes we carry with us. 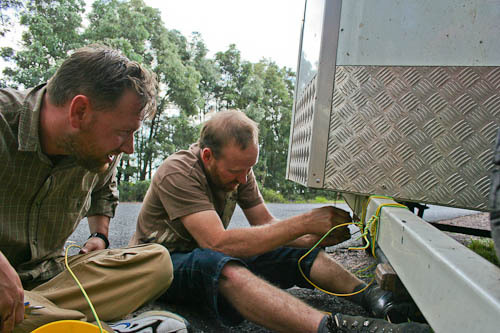 David and Richard improvised with electrical cable and heavy-duty axes to splinter the broken draw-bar. 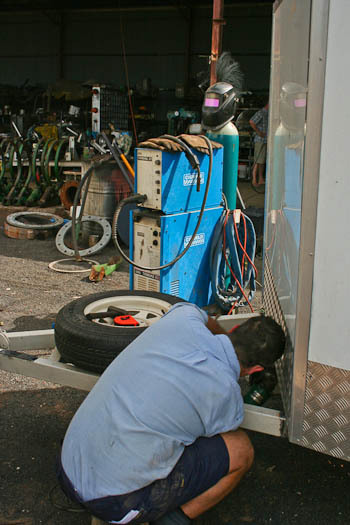 We also emptied the trailer of its contents, loading everything into the back of the truck so the trailer would be as light as possible. We aimed to limp into camp, set up the McGrails’ tent and tackle the trailer issue in the morning. Leaving the back door open so David could monitor the trailer, I drove at 10kmh to the campsite. We had picked a quiet spot down a dirt road, but the road was well-maintained, and we didn’t have many bumps to go over. David used the intercom to talk with me as I drove along. Along the dirt road, a farmer stopped to see if he could give assistance. Jack O’Sullivan was a friendly chap, very knowledgeable about the area, and experienced with heavy machinery. 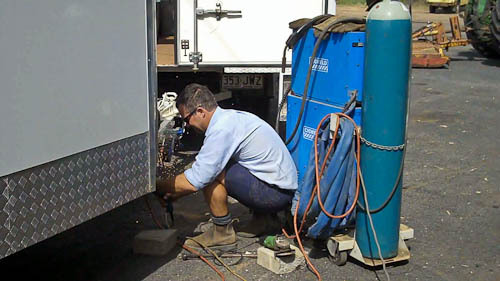 He gave advice on how the trailer could be welded to prevent further problems and explained the quickest route into town. After we parked, we raced the rainclouds to get the tent assembled. Everything was up before the light rain started falling down. Archer’s Crossing features a long, roofed shelter that was very handy for all the gear we wanted to access but keep out of the rain. Rainwater run-off from the roof was captured into a water tank, providing a handy source for fresh water. I spotted this hanger-on in our truck... No one else has seen it yet, although I've seen it once more since I photographed it. 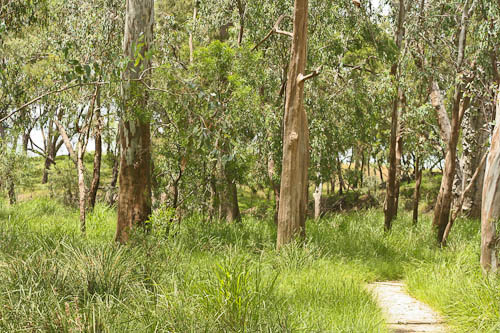 The Condamine River forest at Archer's Crossing featured a bizarre little concrete path that wound along the river bank before ending very abruptly. The first night, we ate sandwiches by the light of candles. We put the girls down to bed in the back of the truck, and David and I slept in the trailer with Delaney as was our new routine. Our campsite at Archer's Crossing centred around this long shelter with a handy table and benches. In the morning, light cloud cover kept us cool. David started a fire and in his search for firewood started the ambitious project of cutting down a dead tree. He managed to saw through the whole trunk, and it fell with a mighty crash. He went in search of firewood and ended up felling a mighty tree. We really like cooking on a fire where it's possible. Sharla used the opportunity to warm up some water for a bath for each of the children. It didn’t take long before our girls wanted to play in the river. 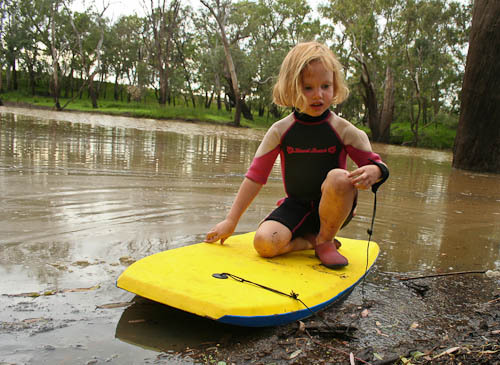 We dressed them in their wetsuits and headed down to the slow, brown water. The natural detritus in the slow, brown water didn't detract from the allure of water-play! 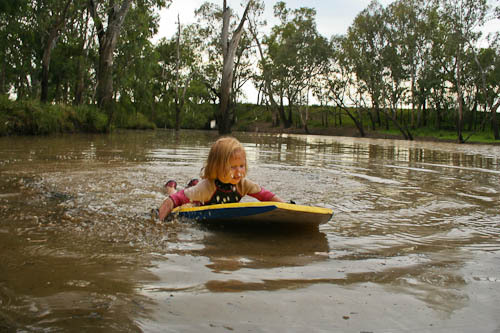 Soon paddling around the boat-ramp wasn't exciting enough, and brave Brioni started swimming further. 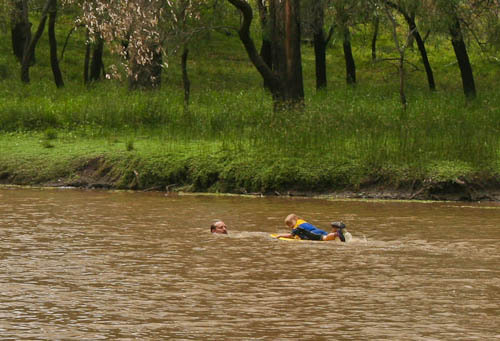 David swam across to the far bank with our girls, and Richard used the canoe to ferry Bronwyn and Jack across. On the other side of the river, the seven explored the grazing pasture, collected flowers and little Jack even brought back some more sticks for the fire. David started by taking Calista (his name for her is "Booty") on the boogie board. After several days of camping (without showers), I, too, was ready for a swim, and I joined the girls in the brown water, encouraging Aisha to swim out further and join me as I swam to the far bank. 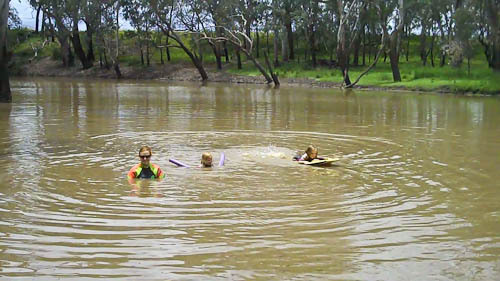 The Condamine River had very little current, with Jack O’Sullivan telling us that it was hardly overflowing the weir upstream, so it was a nice, safe river to be swimming in. I loved playing in the water with the children! 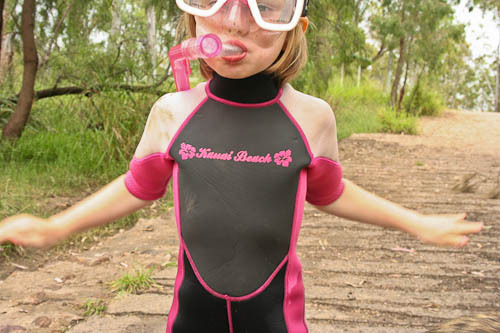 The kids liked playing with our snorkeling gear, although there wasn't a chance of seeing *anything* in THAT water! Later, I took the canoe upstream for a paddle, lying back in the boat as it gently floated back to the boat ramp at our campsite. I dozed in the warm sun and was awakened abruptly by the prow of the canoe hitting the grassy bank. Now that we’re vegetarians, David and I look forward to the gradual demise of the beef industry and the resulting renewal of waterways that have been damaged by grazing livestock. 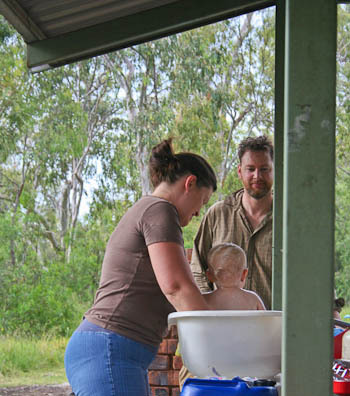 The Condamine River is very brown and muddy — we couldn’t see our feet even when we were ankle-deep in the water — but one day it will run clear again. After our play in the morning, the men headed out in the McGrails’ car to scout Chinchilla and find a place to get the trailer welded up. In their absence, Sharla and I decided to do some housekeeping, and we started washing clothes the old-fashioned way. We set up a series of tubs for washing and rinsing. It wasn’t long before the guys drove back into camp. They had stopped at ‘Green Acres’, a large farm close by, and had asked the farmers for assistance. The Bender family were pleased to help. They announced that they had — as of the day before — finished sowing 3500 acres of cotton and so didn’t have any other pressing business. 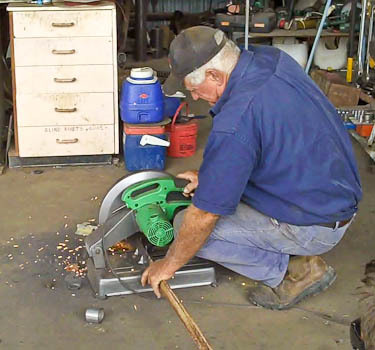 George and Greg — the father and son team — also grow seedless watermelons, contributing to the Chinchilla region’s boast of growing a quarter of all of Australia’s watermelons. 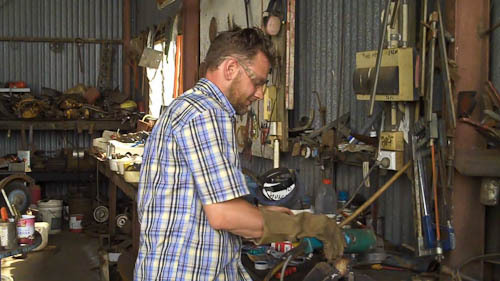 After David and Richard brought the trailer into the Bender’s farm, the men found scrap metal from around their shed and used their tools to weld up the supports on the draw-bar, strengthening it far beyond its original construction. The Benders had all the equipment and used some scrap metal to make up the supporting bits for the trailer. Richard used the opportunity to use some of the Benders' tools and help out. The Benders' work has greatly improved the draw-bar's strength. When Sharla and I were working, the kids played in the bush nearby. They climbed on fallen trees, made mud samosas and eventually went for a swim. In the late afternoon, Sharla finally decided to get into the brown water and invited me for a swim too. She also coaxed Bronwyn to come out into the deeper water to join her. Wearing a life-jacket, Bronwyn loved the opportunity to swim out further, joining Brioni who had eagerly swum out past standing-depth to join Sharla and me in the middle of the river. For dinner, we joined forces to make tortilla wraps with a modified Greek salad. 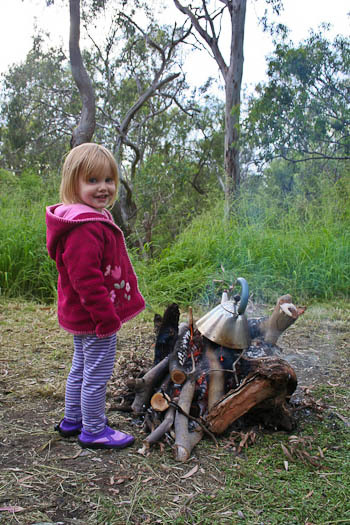 Who says you can’t cook gourmet food in the bush without refrigeration? 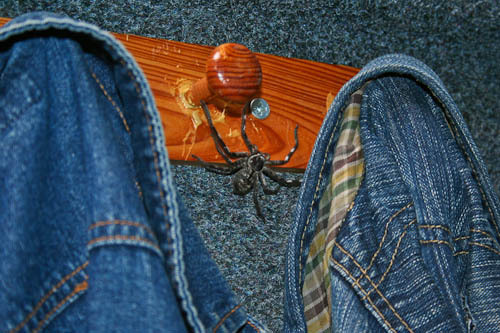 The next day, Richard and Sharla decided to head home. We packed up camp into our respective vehicles. David took the kids along the riverwalk while we sorted through the piles of stuff that we had sprawled upon the long table in the shelter. 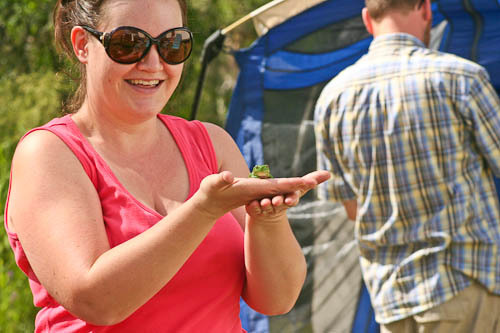 While they were packing up their tent, Sharla found this beautiful green tree frog. After we waved good-bye to the McGrails, our girls went into the river for a last swim before we drove off. We stopped briefly in town before continuing west along the Warrego Highway. 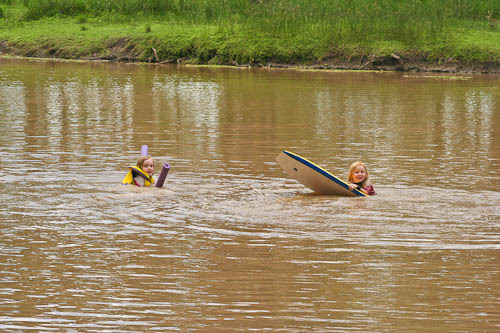 By the end of our second day on the Condamine River, the girls were confident in the safe water.